DML's 105mm howitzer is a great kit, but their choice of wheels and tires isn't typical for a WW II weapon. 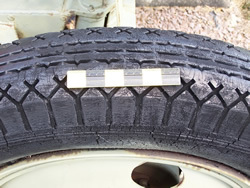 (Not to mention that the tires are slightly undersized.) 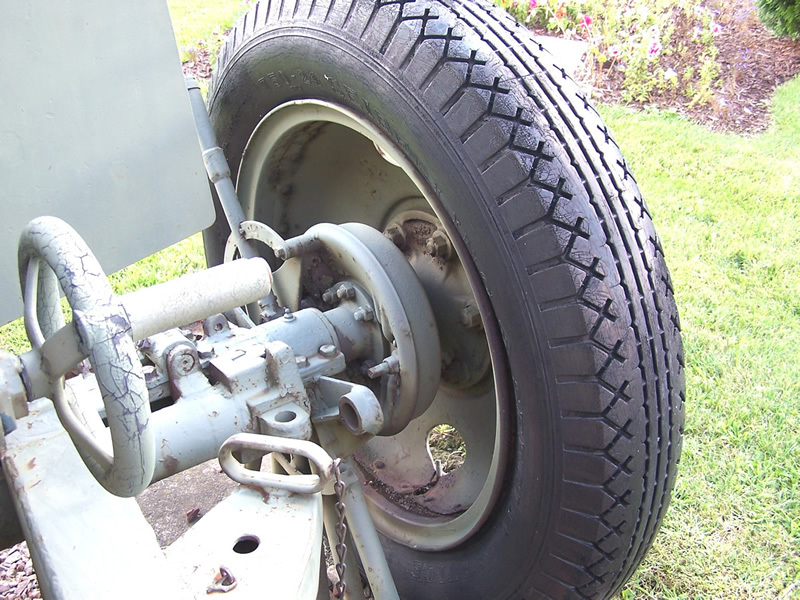 Most photos of howitzers during the war show them mounting highway or civilian tread tires on "six-hole" combat wheels or "two-hole" standard wheels. These are actually two different tire/wheel sizes. The combat wheels are 9.00-20 while the standard wheels are 7.50-24. There is plenty of information out there on the 9.00-20 size but there's not much on the pre-war 7.50-24. Only two carriages used the 7.50-24, and while 105mm howitzers with this size are rare, the M2A3 carriage for the 75mm M1897 gun is relatively common, with a number being preserved at veterans' halls across the U.S. From these we can come up with a goodbut not definitiveset of dimensions for this wheel and tire size. One problem with this technique is that the equipment is suffering from 60+ years exposure to the elements. 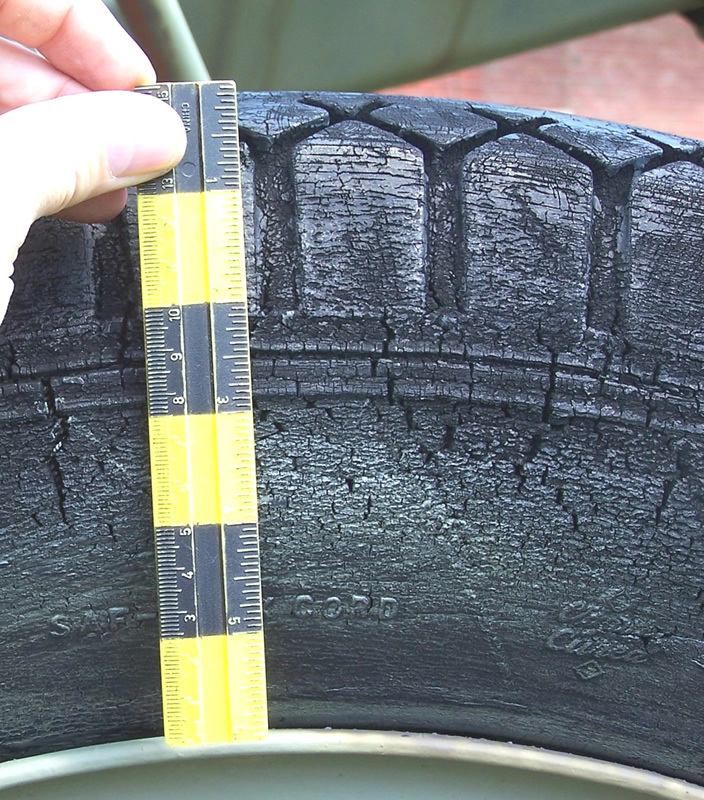 The tires are dry-rotted, deflated, and probably shrunken somewhat form their new, inflated sizes. The wheels have corroded and swollen which makes them somewhat out of round and distorted. 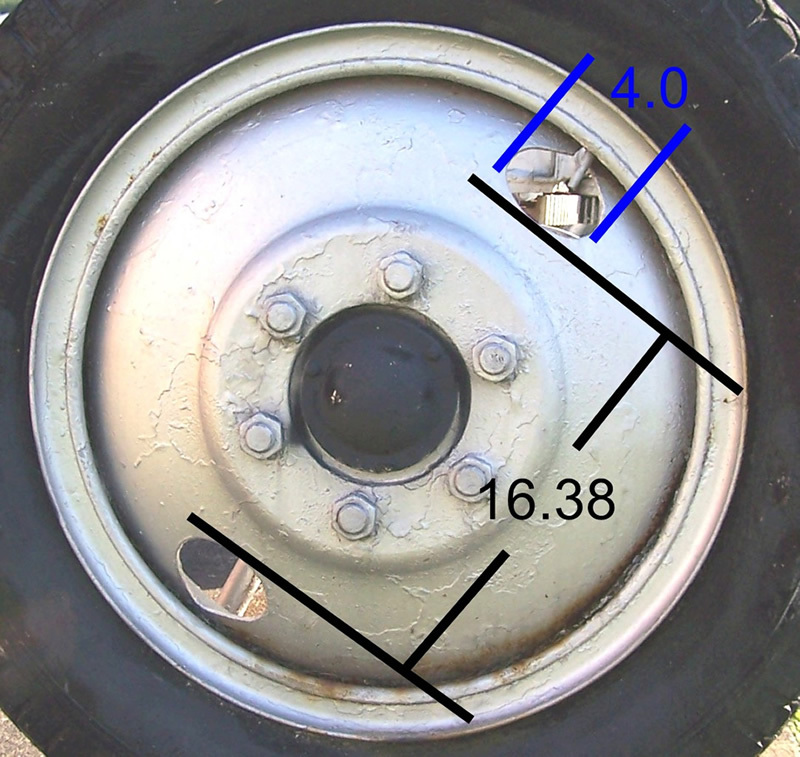 Also, because it is impossible to remove the wheel from the carriage, direct measurements across diameters are blocked by the axle and brakes. 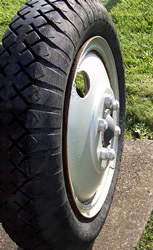 The wheel is a two piece type, size 4.33R-24. The outer flange on the convex face is a split lock ring that snaps into a groove on the disk/rim assembly. The rim is roughly L-shaped in cross-section, forming the inside flange and base of the rim. The disk is a somewhat bowl-shaped pressing riveted to the inside of the rim. 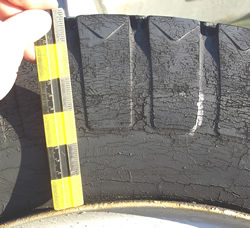 Its thickness tapers from about 5/16 in the center to about 3/32 at the outside. The section contacting the carriage is flat and raised approximately ½ inch above the bowl contour. 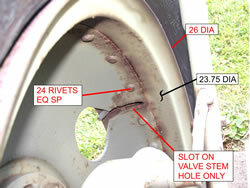 Two holes are punched in the disk; onewhich is slit to the outsideis for the valve stem, the other for balance. The holes are a combination of an elliptical shape and two straight sides, giving something of a teardrop shape. 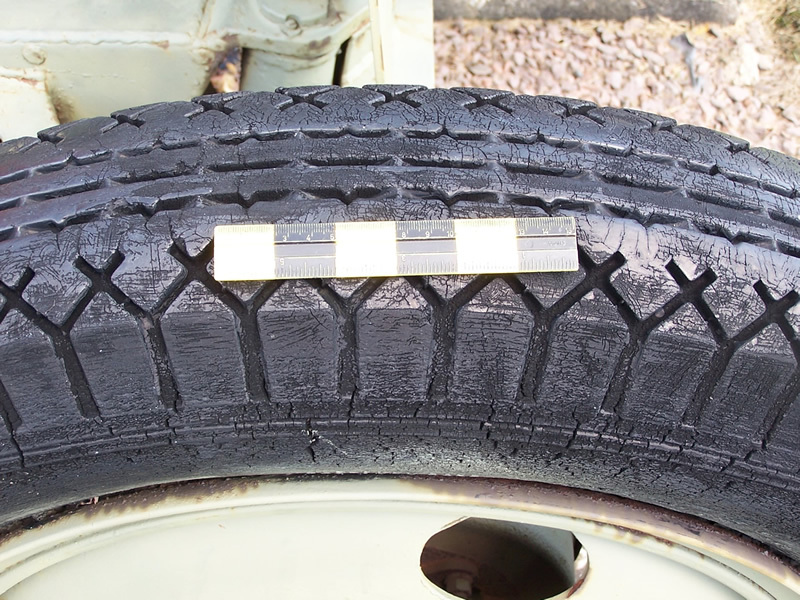 Two types of tires have been seen with markedly different tread styles. Surprisingly, they are both the brand and model! 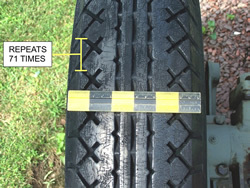 On the first, there is a pattern of lugs starting at the maximum section width and ending at the shoulder with grooves crossing to form an X, and three circumferential grooves at the center of the tread. 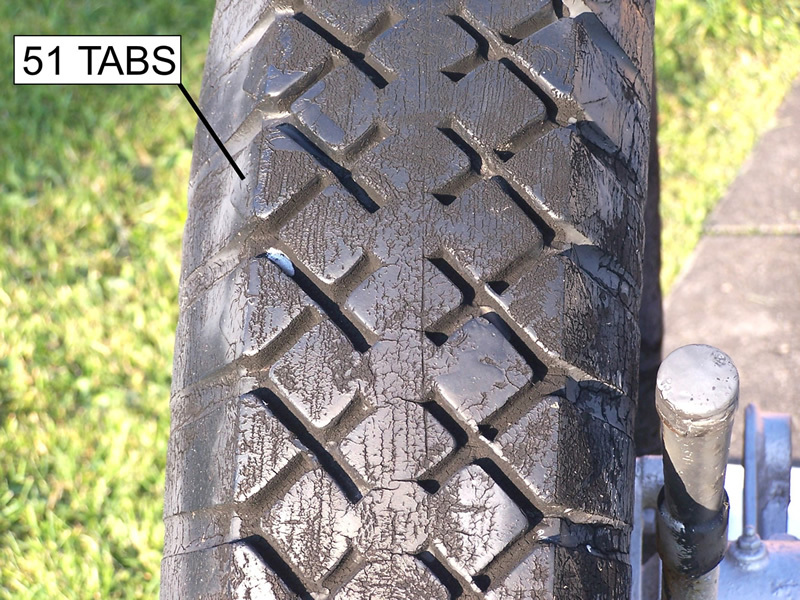 There are 71 identical lugs on each side. 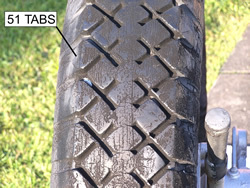 The second type has lugs start about a third of the way up the sidewall but with a similar X groove configuration on the tread face. The Xs reach farther in and there is no circumferential grooving. Also, there are only 51 lugs on each side. 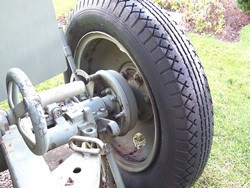 Both tires are the same typeSeiberling Special Serviceso the design must have changed during production. Modern 7.50-24 tires are produced with a 40.3 inch nominal outside diameter. 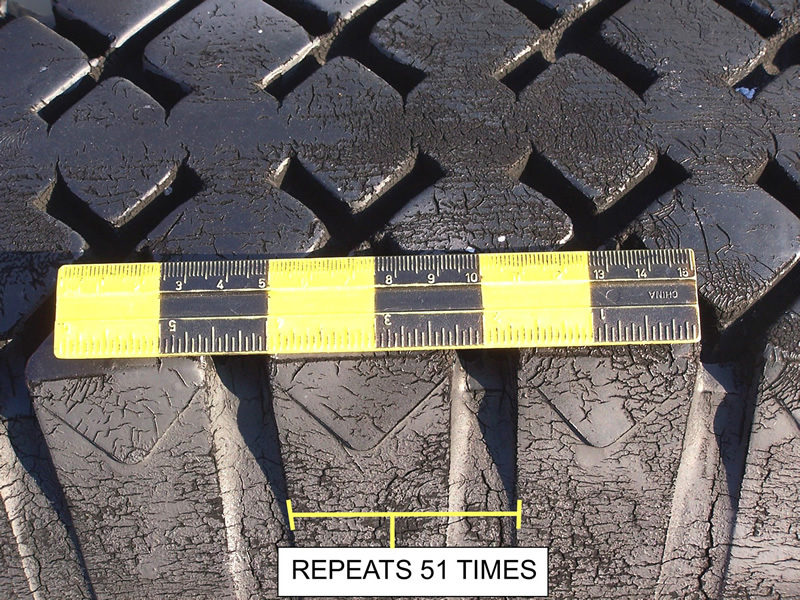 The six surviving tires measured around 39.5 inches outside diameter. 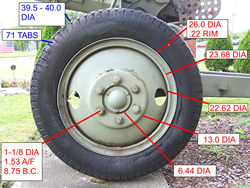 This difference may be a result of the condition of the survivors or an indication that wartime tires were slightly smaller. 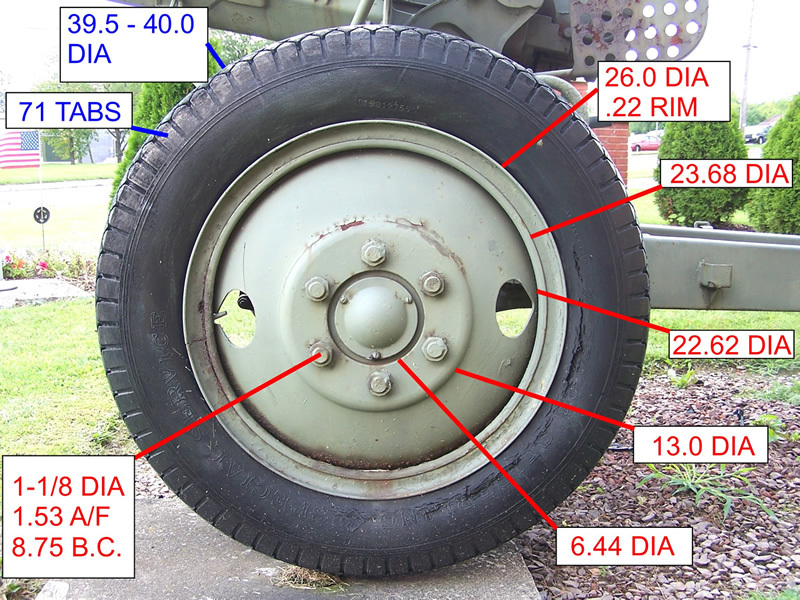 For modeling purposes, a 40 inch diameter seems to be a reasonable value until better information becomes available. The large section view was developed after some trial and error and measurements of several wheels. I ended up using a contour gage to transfer the wheel shape to coordinate paper and plotting the coordinates in CAD. I then did some smoothing and curve fitting to get the best match using likely dimensions. It is still not exact on the inside of the rim where the lockring fits into the main rim, but this contour is practically invisible at 1/1, let alone at 1/35. 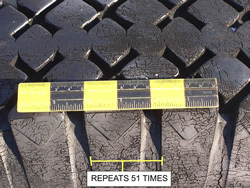 The first sketch shows the two tread patterns, one on each side of the tire. Obviously the real tire would have the same pattern on both sides.